In the previous instalment we learned how to group multiple HTML tags together to define regions within a page, and then how to move those regions around by floating them, or positioning them explicitly. We’ll start this instalment with a little revision – there was a lot to digest last time! While re-visiting the layout from last time, we’ll also look at some of its limitations, and then we’ll move on to look at the CSS display property, how it can be used to alter layouts, and, how we can use it to improve on our demo layout. Because there was a lot of absorb last time, I thought it would be a good idea to re-vist the concepts from last time in a more practical way. To that end I’ve created a little web app for demonstrating CSS positioning. You can download the code here and run it on your own local server, or, you can run the tool from my web server here. You can use the tool to experiment with the different CSS properties we worked with last time, and, there are instructions included to re-create the two-column layout from the demo at the end of the last instalment. Once you have the layout created following the instructions – try expanding the size of the main content region by setting the height of box 4 to 300px. No problems there, the footer moves down, and all is well. Now, let’s see what happens when we make the sidebar longer than the content by setting the height of box 5 to 500px. Uh oh – it breaks our layout! Because box 5 is positioned absolute, it has been lifted out of the normal flow of the document, so it is not actually contained within the green box anymore – it is hovering in front of it, so as it expands, it just continues on obscuring part of the footer. This tells us that our layout has a limitation – it only works on sites where the content is longer than the sidebar. We have already encountered the concept of block-level tags, and inline tags, and we have mentioned that there are a few tags that behave a little oddly. We’ve learned that headings and paragraphs are block-level tags, emphasis is an inline tag, and that images are an example of a tag that behaves neither exactly like an inline tag, or a block level tag. That is a simplification that omits one important point – headings are block-level tags by default, and emphasis tags inline tags by default. Using the display CSS property, we can override these defaults. We’ve also hinted that while most tags default to block or inline, that there are some oddballs – well, those oddball tags have display values other than block or inline, and we’ll also look at some of those other possible values for display. This not an exhaustive list of all possible values for the display property though, just the ones you’ll need most often. Setting the display property to block will cause any HTML element to be displayed as a block-level tag, no matter what its default behaviour is. That is to say, it will start to behave in the same way as paragraphs do. The display property of block-level tags like <h1>, <p> and <blockquote> default to this value. Setting the display property to inline will cause any HTML element to be displayed like an inline tag. The display property of inline tags like <strong>, <em>, and <code> default to this value. Any element with its display property set to none will not be displayed on the page at all – it will in effect be poofed out of existence! Although we haven’t been explicit about it, we have already encountered a tag that has a default display value of inline-block – the <img> tag. An inline block element will behave like a letter within some text, though perhaps like a very very large letter! This is the default value – the bottom of the inline block is aligned with the font’s baseline – that is, the imaginary line the letters sit on – note that letters like p and q punch through the baseline (and are hence known as descenders in typography circles). Align the inline block as if it were sub-script or super-script text. The top or bottom of the inline block are aligned with the highest or lowest item on the line – whether that item be text or another inline block element. The top of the inline block is aligned with the top of the text, or, the bottom with the bottom of the text. After baseline, this is probably the value you’ll need most often – the middle of the inline block is aligned with the middle of the text. The example cartouche above has its vertical-align set to middle. If an inline block’s vertical-align is set to a dimension, it will be shifted by that amount relative to the baseline. If the value is positive it will be shifted up, and if negative, down. Raises or lowers the inline block by a percentage of the line-height. Positive percentages shift the inline block up, and negative percentages shift it down. Displaying items as inline-block can be used to make a line of fixed-width items behave nicely as the page re-sizes. You can see this in action in the CSS Playground web app used earlier in the instalment. The main form headed with the legend Control Panel contains sub-forms with legends indicating the box they control. The main form has its display set to block, and its text-align set to center. The mini forms each have their display set to inline-block, their text-align set to left, their width set to 185px, and their height allowed to default to auto. In this case, the tags for the forms intentionally do have some white-space between them (a line break), so in effect, each form behaves like a 1-letter word. As the window is re-sized, the containing form grows and shrinks as you would expect for a block-level element. The mini forms behave like words, and move nicely onto multiple lines as needed. 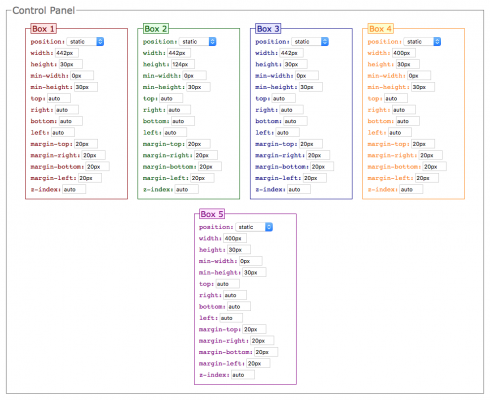 A new concept known as flex boxes was added to CSS 3 to help make layouts more robust. You can build nice layouts with a combination of floats and positioned boxes, but all such layouts have shortcomings, as we saw at the start of this instalment. 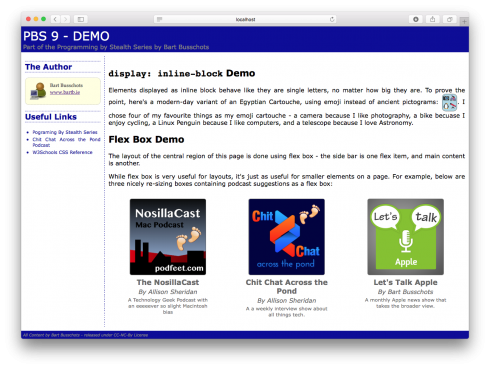 This instalment’s demo re-creates the same two-column layout using a CSS 3 flex box, and the resulting layout is much more robust. It looks the same, but behaves just as nicely regardless of which column is the tallest. Flex boxes are very powerful, and hence, very complex. It would take us two or even three entire instalments to cover every detail of flex boxes. We’re not going to to do that – instead, we’ll just look at the basics, and link out to some helpful resources should you find yourself needing to control more aspects of your flex boxes. To use flex box, you need a containing element to hold the boxes that will be flexibly sized. This is known as a flex container. Any box can be turned into a flex container by setting its display property to flex. All direct children of this container are now flex items. Flex containers either behave as rows or columns. The default is to behave as a row, and that is the only behaviour we’ll look at in this instalment. The CSS property for controlling the direction is flex-direction, and its default value is row. What makes flex items inside a horizontal flex container different to normal inline or inline-block boxes is that they all stretch to be the height of the tallest box. This is exactly the behaviour we want for typical web layouts. The order in which the boxes appear in the row does not have to be the same as the order they appear in the code, so, like with positioned layouts, we can place the side-bar below the main-content in HTML code, and still have it displayed as the first item in the layout row. As their name suggests, flex boxes, and the items within them, are designed to grow and shrink as pages are re-sized, and they can do so in very clever ways. In our example layout, we would like the sidebar to always be 200 pixels wide, and for the main content region to do all the shrinking and growing as the window is re-sized. 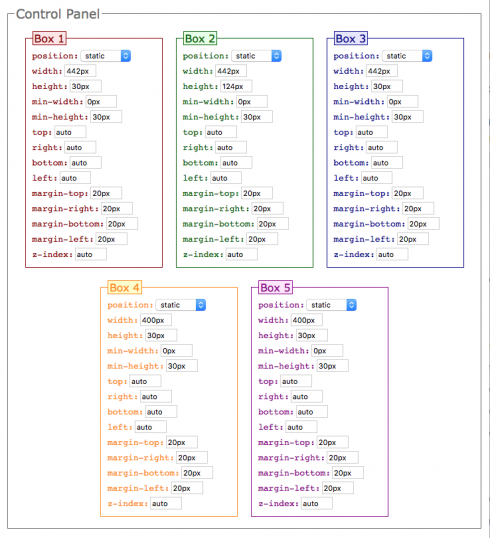 You control how a flex item shrinks and grows using the flex CSS property. To fix an item’s width, like we want to do with our side bar, set flex to none, and set an explicit width on the item. To allow an item shrink and grow, set flex to 1. If you have multiple flex items within the same flex container that you want to have shrink and grow, but to have be different widths, you can use the flex property to define a ratio. If you have two flexible flex items, and you want one to be twice as big as the other, set flex to 1 on the small one, and flex to 2 on the big one. This is actually a gross simplification of the flex property. In reality, flex is a shorthand CSS property for three underlying properties that give very granular control over the way flex items behave. We’re not going to dig into this complexity in this instalment. The order property can be used to change where in the row different flex items appear. In our example we will set order to 1 on the sidebar, and to 2 on the main content region, that way the sidebar is on the left, and the main content on the right. <span class="cartouche"><img src="contrib/twemoji/16x16/1f4f7.png" alt="Camera" /><img src="contrib/twemoji/16x16/1f6b4.png" alt="Mountain Bike" /><br /><img src="contrib/twemoji/16x16/1f427.png" alt="Linux Penguin" /><img src="contrib/twemoji/16x16/1f52d.png" alt="Telescope" /></span>. The demo for this instalment looks very similar to the one for the previous instalment, but the big different is that the over-all layout is now implemented using flex box instead of positioning. The <div> surrounding the main content and the sidebar has been set to display: flex, the main content has been set to flex: 1, and the sidebar has been set to a width of 200px, and flex: none. The demo also contains an example of display: inline-block in the form of the cartouche made of four emoji icons. Finally, it also contains and example of a flex box being used to create three even-width boxes which scale nicely as the page is re-sized. We’ve now touched on the three CSS properties that together allow us to control the layout of an HTML document – float, position, and display. Think of these three properties as the atoms from which all modern web layouts are built. On the bad old days before CSS, layouts were done using HTML tables – I can’t stress how important it is not to build pages in that way. It should also be noted that another new CSS feature is currently under development that will make layouts even easier in future – CSS Grids, but that feature is a few years away from main-stream use yet. At the moment only one browser has proper support for the feature – Microsoft’s new Edge browser.